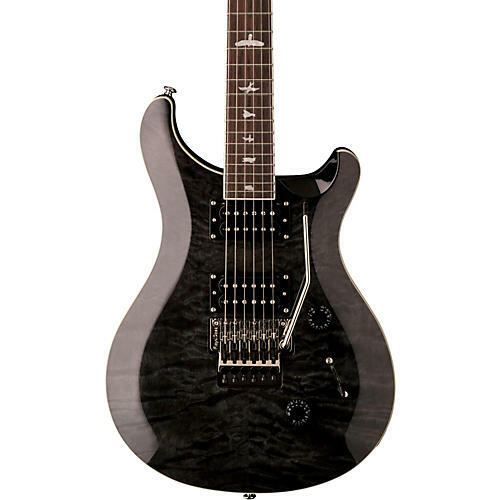 The popular SE Custom 24 is now available in an exclusive finish. It gets an edgy makeover with the addition of the Floyd Rose 1000 Series tremolo. When you dig into the Floyd Rose Tremolo paired with SE 85/15 Treble and Bass pickups, you'll love the sound that comes out – and your neighbors may come knocking. The SE Custom 24 pays homage to the guitar Paul Reed Smith took to his first tradeshow in 1985 and is now offered with a Floyd Rose 1000 Series tremolo. This tremolo is Korean-made with the same design and high-quality materials as the “Original.” The SE “Floyd” Custom boasts SE 85/15 Treble and Bass pickups paired with a push-pull tone control and 3-way blade pickup switch for coil tapping. Includes gig bag.